This comprehensive self-study exam prep guide is based on the 2014 edition of the National Electrical Code® and contains twelve (12) twenty-five question practice tests and 2 (two) eighty question final exams, with types of questions you will encounter on actual licensing exams. 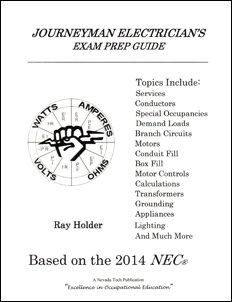 This book is the best self-study guide available for journeyman electrician’s exam preparation. Answer keys with NEC® references included. This type of study is designed to help you identify your strengths and weakness and reinforce your weak areas. 180 pages, 8½” x 11″, spiral bound.